Eastern senior Dylan Creath attempts to avoid a South Gallia defender following a catch during Friday Night’s Tri Valley Conference Hocking Division contest in Tuppers Plains, Ohio. 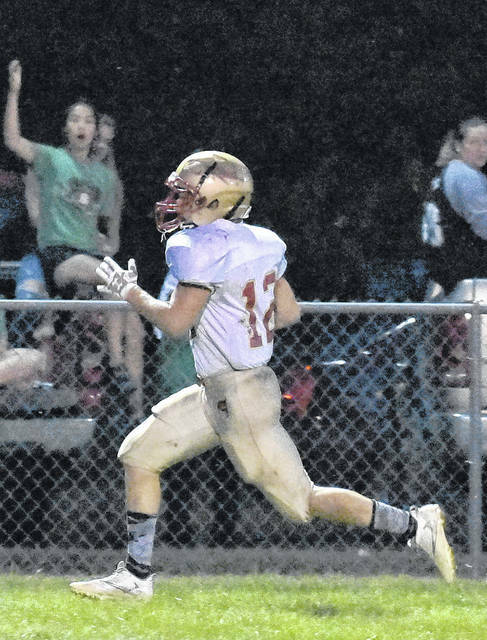 South Gallia junior Jacob Birtcher sprints toward the end zone following a catch during Friday Night’s Tri Valley Conference Hocking Division contest in Tuppers Plains, Ohio. TUPPERS PLAINS, Ohio — Inside of a minute to go and clinging to a one point lead, the Eastern defense came up big during Friday’s 14-13 Homecoming win at East Shade River Stadium. Senior Dylan Creath intercepted the pass from South Gallia quarterback Tristan Saber in the end zone with 49 seconds remaining in the game to secure the victory for the hosts. It was the fourth consecutive victory in the series for the Eagles, but their first win of the 2018 season. Penalties and a turnover caused problems for Eastern early, with the Eagles turning the ball over on the first possession after the snap went behind the quarterback. South Gallia’s Gavin Bevan recovered the ball at the Rebels 44 yard line to set up the first scoring drive of the game. One pass play, followed by a steady does of runs by Jeffrey Sheets moved South Gallia to the Eastern 37 yard line where Jacob Birtcher took the ball in for the touchdown. The kick by Kenny Siders was good to give the visitors a 7-0 advantage. The Eagles looked to answer on their next drive, going 58 yards on nine plays. Sophomore quarterback Conner Ridenour completed four of five passes on the drive for 53 yards, including the three yard touchdown pass to Steve Fitzgerald on a fourth and goal play. With the extra point kick attempt no good, the Eagles trailed 7-6 at the end of the first quarter. South Gallia went 75 yards on its first drive o the second quarter to increase its lead to 13-6. Sheets continued to move the ball on the drive, with the three yard touchdown run straight through the middle of the line. The pass attempt on the two point conversion was no good. Once again Eastern’s offense responded after the South Gallia score. Beginning the drive at their own 33 yard line, a mix of runs from Fitzgerald and Blake Newland moved the ball in to South Gallia territory, with Ridenour completing passes on three of the final four plays, including the eight yard touchdown pass to Blaise Facemyer. The two-point conversion pass on a fake kick attempt was good with holder Facemyer completing the pass to Fitzgerald. A fumbled hand-off on a fourth down play and an interception by Isaiah Fish ended the next two possessions for the Rebels, but Eastern would not gain a first down on wither of the resulting possessions. The Eagle took the 14-13 lead into the locker room at halftime, a score that would stand after 24 more minutes of play. The Rebel special teams showed a spark mid-way through the third quarter as Kyle Northup ran for 19 yards on a fake punt, enough for the first down and to move the ball into Eastern territory. Faced with a fourth-and-five from the 32 yard line of the Eagles, the pass fell incomplete, with Eastern also declining a holding penalty against the Rebels. Eastern’s drive stalled near mid-field, as they failed to convert on a fourth down and one, giving the ball back to South Gallia. The Rebels were unable to capitalize on the good field position, turning the ball over on downs at the Eastern 33 yard line. Eastern made steady progress into South Gallia territory before a fumbled snap which was recovered by Bevan, his second recovery of the game. Nate Durst intercepted the South Gallia pass three plays later to give the Eagles the ball back. 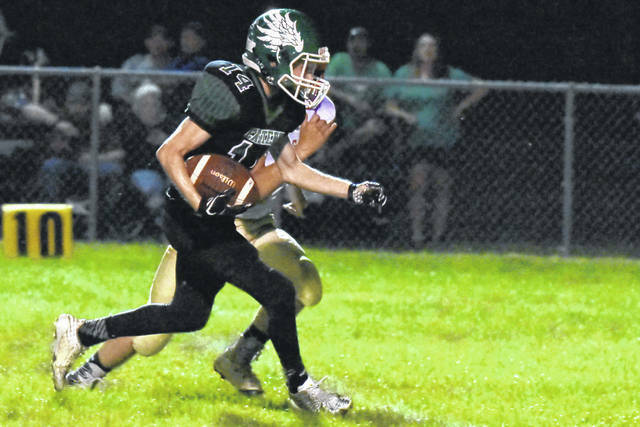 The Eagles looked ready to score, with Ridenour attempting to run the ball in from nine yards out, but he ultimately fumbled on the one yard line, with the ball recovered by South Gallia’s Garrett Saunders. With 5:39 remaining in the game, South Gallia needed to go 99 yards to retake the lead. A mix of pass and run plays, the Rebels made their way into Eastern territory while taking time off the clock. Under a minute to go, the Rebels lined up for a second down and three yards to go play with quarterback Tristan Saber looking for a receiver in the end zone. Eastern’s Creath came down with the ball, giving the Eagles possession and ultimately the win. Eastern head coach Pat Newland praised the efforts of his team, particularly the seniors. Of the late game interception by Creath, Newland said his team was prepared for the deep pass play. “Earlier in the season our defensive back got picked on a little bit. Senior Creath, he did his job….we kept telling them ‘they’re going to try a shot deep, they’re going to try a shot deep’. He stayed disciplined and went up and got the ball and made a great play,” said Newland. “I thought we played good, we just didn’t execute,” said South Gallia Coach Mike Smith following the loss. “Both teams played pretty good defense all night really, they just capitalized on a couple things that we didn’t. That was the difference in the game,” added Smith. Offensively, Ridenour led the Eagles with a 12-of-18 passing performance for 129 yards. Blake Newland led Eastern on the ground with 18 carries for 72 yards, followed by Fitzgerald with 13 carries for 56 yards. Fish was the leading receiver for the Eagles with three catches for 46 yards, followed by Creath with one catch for 30 yards. For the Rebels, Kyle Northup led the way with 12 carries for 74 yards, followed by Bevan with five carries for 52 yards. Saber was 7-of-15 passing for 56 yards, while also tossing three interceptions. Jared Ward led the South Gallia receivers with four catches for 34 yards. Eastern improves to 1-4 overall and 1-2 in TVC Hocking play, while South Gallia falls to 1-4 overall and 1-3 in league play. Eastern will travel to Wahama next week as the Rebels return to Meigs County to face the Southern Tornadoes in their homecoming game.